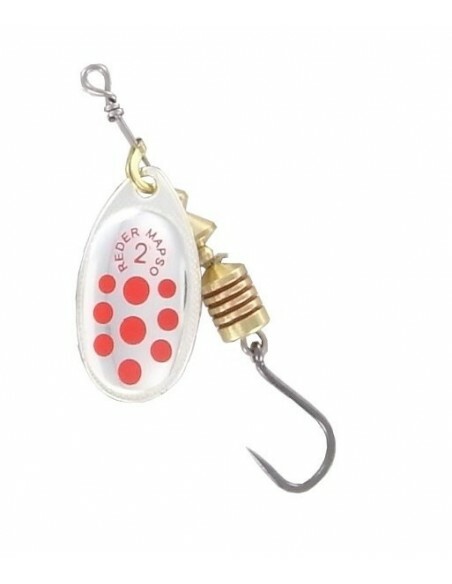 Heavyweight rotating bait-weigh: 10 gr. Very efficient in deep water. The rounded-blade design gives a more open turn characteristics. Made in silvver, gold or copper tones, making it easier to choose the right bait for water conditions. Available with fly. Its lightweith design makes for a bait that is useful in swift-lfowing, high-resistance water. Available in three versions: triple, fly and minnow. 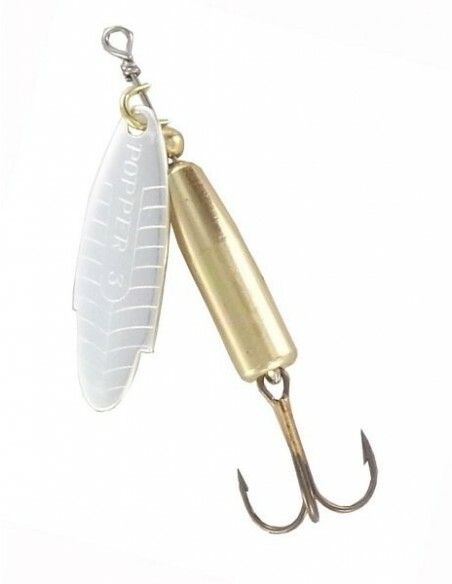 The olive-shaped blade of this bait makes it useful in strong currents. The range is available in three finishes: silver, gold and copper. This offers a choice of bait according to waer lighting conditions. Using the coloured version, the roattion of th eblade in the water gives off a reddish tinge that attracts predators. A disign that mimics natural nymph flies. 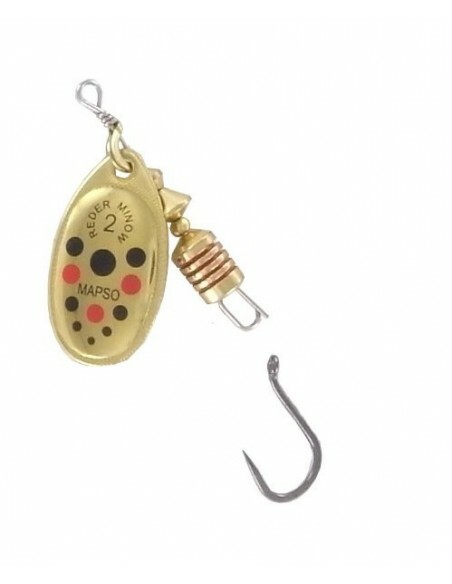 Heavyweigh olive-shaped bait with narrow blade and good rotational characteristics, available in several colours. Recommended for use in high-resistance, fast-flowing currents, deep water, and counter-current fishing with constatnt rotation. Gives good results in water where predators do not react swiftly to other types of bait. The Tandem Ninfa is designed to catch large predators, specially poike and salmon. 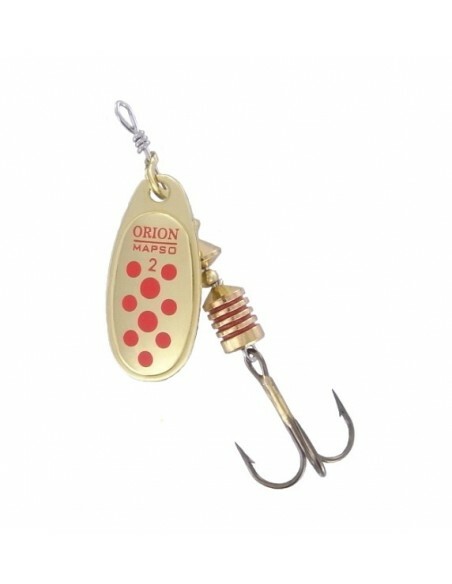 Designed as a variation of the Orion model, with option of changing the hook. This item offers the possibility of changing th ehook for a Triple-Double-Simple-Vinyl-Fish, etc. Excellent bait for large predators. For salmon and large trout fish. Available in several colours. Simulates a fish under water, alerting predators. Owing to its detachable hook system, this model lets you change the hook for other types such as vinyl, fly or barbless, and combine it with other spinners. The main feature of this spinner is the function of the spatula which spins on its axis and maintains the spin angle by menas of the pressure of the water currents. A highly original design, due to its sound transmission characteristics. Attracts all types of carnivorous fish. Particularly effective in catching pike, trout and perch. Simulates low-frecuency sound waves transmitted by the more active species of prey fish. The deign of the Vlason menas that the bati protects against line-twisting. Regardless of speed, the bait always works smoothly, maintaining stability even at low line speeds. A wide range of colors and weight make this a very effective bait for use in quiet and fast-flowing water alike.